A National Wild and Scenic River, the Metolius River flows through the Deschutes National Forest several miles northwest of Bend. Stop and share fishing news with the locals in Camp Sherman, Oregon as you stock up on your gear and other essentials. This short river is just over 28 miles long. Starting at Metolius Springs, it flows into Lake Billy Chinook and the Deschutes River. Anglers can enjoy catch and release fly fishing for salmon and trout. Multiple trails provide scenic routes for bikers, hikers, and horseback riders. The Metolius River is a beautiful river in Central Oregon that flows several miles north of Bend. 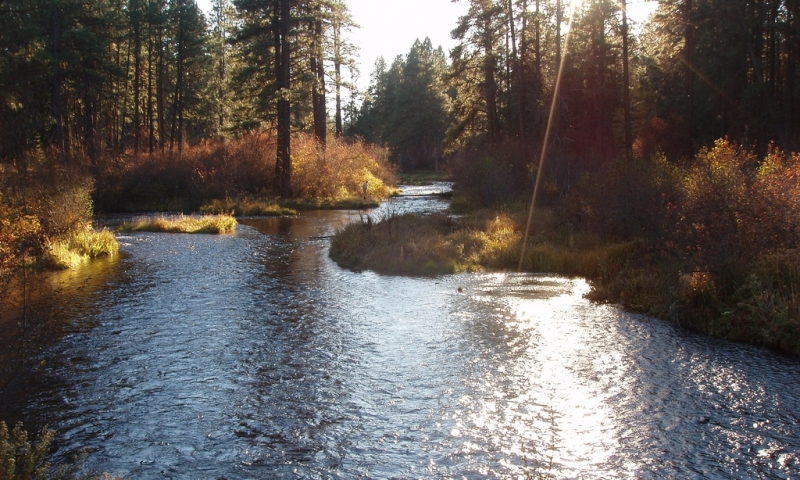 Just over 28 miles long, the river’s waters originate at Metolius Springs. Passing through the thick fir, cedar, and old growth pine of the Deschutes National Forest, the Metolius River winds its way east to Lake Billy Chinook on into the mighty Deschutes River. Camping, fly fishing, and whitewater rafting are popular activities for those who visit the area. The Metolius River, OR, flows several miles northwest of Bend into Lake Billy Chinook. Sport Fishing – Fishing is a popular past time on the Metolius River, Oregon. Only catch and release fly fishing is allowed in the river. Rainbow trout, bull trout, and Kokanee salmon are found in this beautiful river. There are many private homes along the Metolius River and special regulations apply. Make sure you are fishing in public water and with appropriate gear. Trails – There are several miles of scenic trails that take hikers and bikers along the river and into the surrounding forest. Horseback riding is also popular on these trails that boast colorful wildflowers in the summer and vivid maples in the autumn. Wizard Falls Fish Hatchery – Visitors can stop by this hatchery where salmon and trout are raised. It can be found just over 10 miles north of the river’s headwaters. 17 miles of the river flow along the boundary of the Warm Springs Indian Reservation. No motor vehicles are permitted in this area. Scenic river east of the Sierra Mountains.